Another mega-multi design machine has been setup in Downtown Disney in Walt Disney World Orlando. I don’t know if that’s actually what it should be called but that’s what I’m going with. This is a similar machine to the one I visited and wrote about at Hollywood Studios that had 12 designs. Unfortunately this machine doesn’t have 12 designs but rather only 8. Doesn’t make much difference to me as I still think these new machines are really cool and hopefully get some people who wouldn’t usually get a pressed penny to try it out just for the unique experience. Unfortunately I wasn’t able to use this machine in person since I’m stuck in Jersey until our next trip to Florida. Instead a friend of mine was at a conference in Orlando and one evening went over to get the pennies for my collection. His phone was dead by the time he was visiting so he didn’t get to take a picture of the machine cabinet but from what he described to me it sounds very similar to the one at Hollywood Studios. 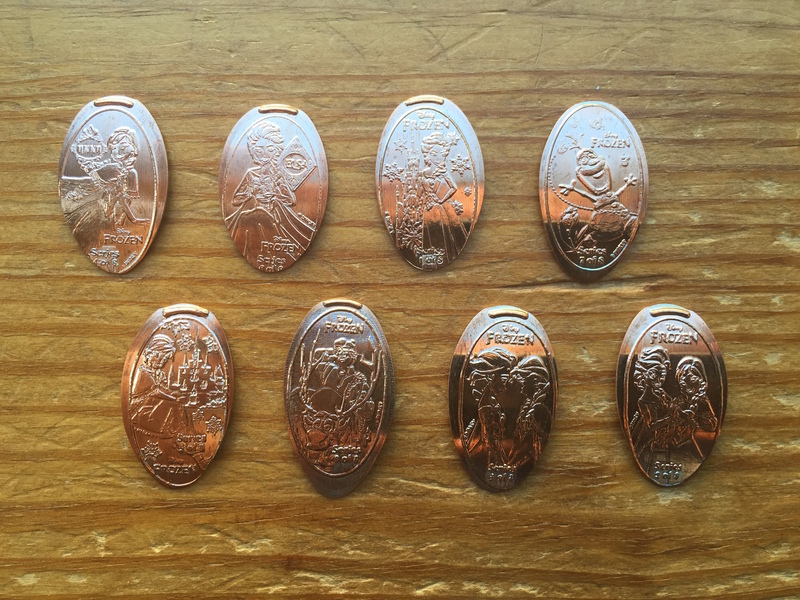 As I mentioned this machine has 8 designs which are all part of a series about the popular Frozen animated movie. These designs are different from all other Frozen designs currently available at the parks, and makes a really nice sub-set to collect. Just like the other “mega-multi design machine” (I’m going to get this the official name just watch!) each individual design is $1.00 to press, or you can get all 8 for $5.00. The machine does supply the coin which could be good or bad depending on your luck. The designs are: #1 Elsa with her Snow Castle, #2 Anna & Elsa holding a Snow Flake, #3 Anna & Elsa looking at each other, #4 Anna, #5 Anna sitting in front of the Castle, #6 Elsa, #7 Olaf, and #8 Sven & Kristoff. Phew! As you can see from the picture above I lucked out with some nice shiny pennies, but I know these aren’t pre-1982 as I usually prefer. A couple of the designs pressed a little short at the bottom but for the most part they came out really nicely. Hopefully as time goes by we will see more and more of these machines placed on stage. The higher cost per coins is a little worrisome, but I do like being able to get larger quantities of designs in one place. There’s no such thing as too many pressed coins!